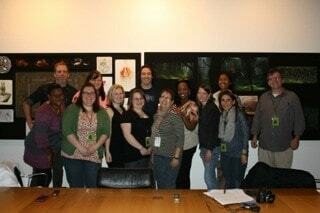 Our final interview to share with you from our day at Pixar Animation Studios is with Mark Andrews, director of Brave. Mark Andrews talked with us about his beginnings in animation (and what he was originally planning to do instead), his enthusiasm for Brave, and the musical score. Brave is in theatres everywhere June 22nd, 2012. Mark Andrews has had a passion for drawing for his entire life. Almost everything he knows about drawing is completely self-taught; he didn’t take his first art class until college. He originally planned on entering the military. He didn’t even know it was possible to make a career out of his talents. “Through a class in city college I found at about Cal Arts down in Los Angeles which was a school started by Walt Disney. And I said, I can actually have a career where I’m just drawing all the time? Done. Check and that’s about as far as my inhibition went. Everything else, doors just opened for me and I just jumped through.” Andrews eventually studied at Cal Arts, and was one of five individuals awarded with an internship at Disney. It took 7 years for Brave to get made. “I go in, I go in full throttle. 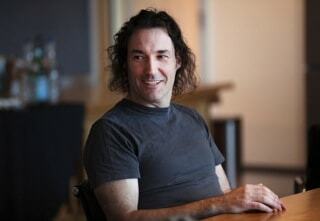 I’m not timid.” There were some challenges along the way with Brave; they began using new technology that was necessary to make the film a reality. There was also a change with directors. Originally the writer, Brenda Chapman, was hired to direct. She would have been Pixar’s first female director. “We’ve had director changes here at Pixar before and this is just, you know, the thing that needed to happen to free it up to break it. So I come in. They asked me to take over. I come in, I look at it. It’s a great story. These great characters. This character theme. This parent, child story, right? Set in Scotland that I love. It’s medieval that I love, right? I’m all okay, what, how do we fix this? So kind of coming in and being an objective eye.” One of the biggest changes that was made once Mark Andrews took over involves some weather scenes. Mark Andrews had very little input with the music that is featured in the film. However, he was pleased to have the talents of Patrick Doyle (Harry Potter and the Goblet of Fire, Thor, and Eragon, to name just a few of the movies he’s composed for). “He’s amazing. He’s just a jolly little fellow. We just laugh and have a great time every time we work together and he’s a consummate professional too, you know and he’s just really fantastic about getting to the hearts.” The music was recorded in London with the London Symphony Orchestra, who also performed the music from Star Wars films.